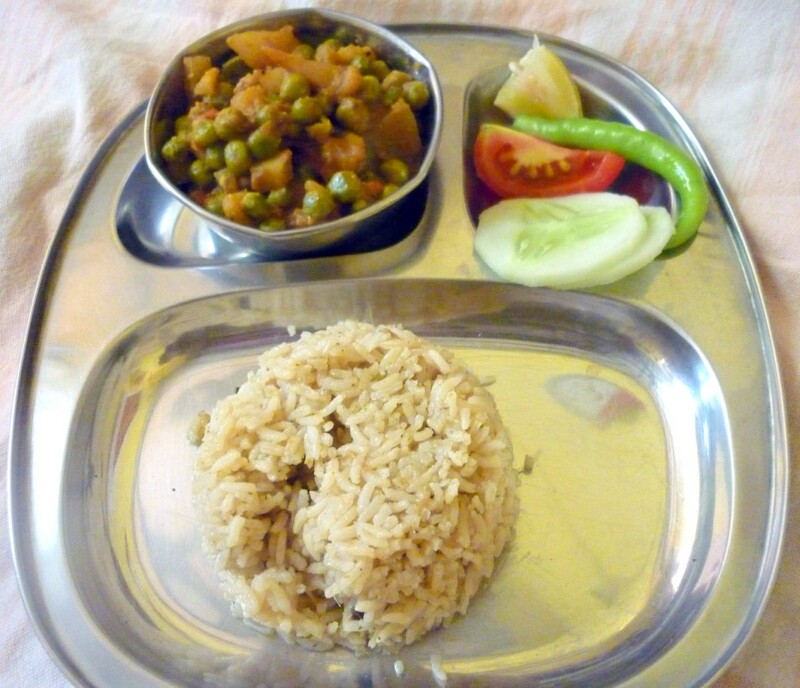 This simple version of Aloo peas masala uses a different ground masala from my regular one. This is what my sil made for me, while it was a non veg feast for the rest of the family. They served it with Chapati and it was really very delicious. I am sure butter Naan would have been even better. 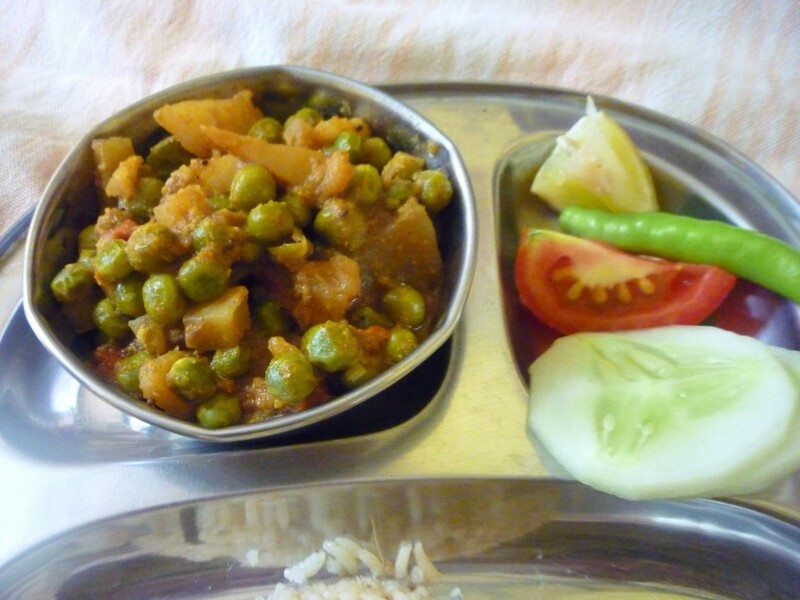 I already make Aloo Matar Masala in couple of different ways. It was interesting to note that raw peanuts made gave this such a different and yummy taste. Grind the ingredients listed for the paste to a smooth texture using water. Keep it aside. In a pressure cooker, add oil, saute the finely chopped onions till they start turning colour. Add ginger garlic paste and saute till it’s done. Takes about 2 mins or so. then add the tomatoes, saute well. Once the tomatoes are soft, add the ground masala, salt to taste, turmeric powder, simmer and cook till the oil starts leaving the sides. Keep stirring in intervals to make sure the bottom doesn’t get burnt. Then add the peas, potatoes, saute for couple of mins in the masala. Add water and cover with the lid. Pressure cook for 2 -3 whistles. Once the pressure falls, check if the potatoes are cooked. Cook further if you want a thicker gravy. If you want the gravy to be little thick, mash couple of potato pieces and continue cooking in low flame. So along with this classic ground masala paste, this can also be considered as a variation if you want to try for vegetarian gravies. One of my favourite vege…….U have done it perfectly. Great side dish for chapati’s and rotis !! tasty one !! always a hit for chapathi/puri…. I like ur RECIPIES and even the recipe photos how do u get time and is anybody helping with your work of publishing. Can I get any help or tips from you on how to start my blog and topics that interest others.